For the first time in my life, I’ve learned more about my self that I’ve ever cared to know. But in particular, I know that I’m no longer satisfied with sharing my life with just anyone. I have written down, “Never settle for less than God’s best!” Settling in my life is something I unconsciously chose to do, because the way I saw myself left more to be desired. For all intents and purposes, let’s call this low self-esteem. Because I didn’t know my worth, I was treated less than I’m worth. Can you dig it? My father said this to me on Father’s Day, “Son, you will meet a woman who will treat you like a prince. When you do, you make sure you treat her like a princess.” Gotcha, Pop. I totally get what he’s saying. The key is that there is a mutual, genuine appreciation for one another. I won’t need to “put on” and this & that to gain her attention. She’ll recognize and appreciate me for who I am (as I will her). I would dare to say that we all want to be appreciated in all our relationships (family, platonic, or otherwise); And if we are not appreciated, the right is yours to leave. 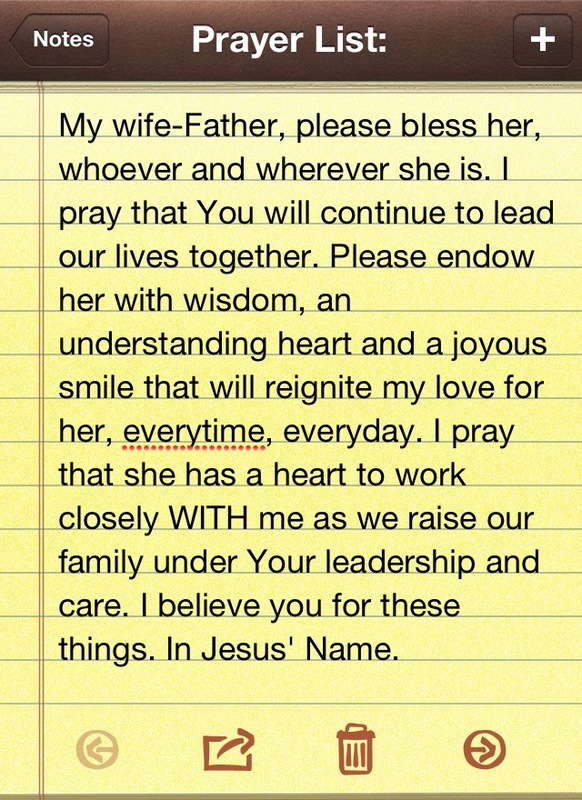 And with that, I leave you with a snapshot of my prayer list. You’ll know who it’s for when you read it. Remember: Settle not for just anyone; Settle for THE ONE. Thank you, Trisha. I appreciate your encouraging words. Thank you for reading, too!